European Type Hammer Crusher is widely used in mining, building materials, chemical industry, metallurgy, cement, ceramic, refractory industry and so on. The European Type Hammer Crusher is suitable for secondary and fine crushing all kinds of rocks with compressive strength less than 320 MPa. 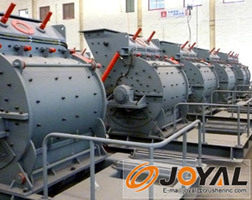 Features of European Type Hammer CrusherThe European Type Hammer Crusher is of high capacity, high crushing ratio, simple structure, easy maintenance, easy operation, even output granularity and electricity-saving.In order to avoid blocking, the water content of materials are less than 10% - 15%. Working Principle of European Type Hammer CrusherThe European Type Hammer Crusher mainly includes case, rotor, iron bearing, grate bars and other components. There are two parts in case: the upper one and lower one which are welded after cutting. The remaining parts are connected by bolts. Inside the case, there is high manganese steel liner which can be replaced after wear and bear. The European Type Hammer Crusher is installed on an array of spindles which forms the rotor together with rotary table and axis. The rotor rotates through motor and V-belt driven spindle. The hammer streths around as the centrifugal force generated by rotation, in that way, bulk materials feed into the crushing chamber and are crushed by the high-speed movement. The standard stones pass from the grate bars below and for those not standard will again be crushed in the case till they can pass from the grate.